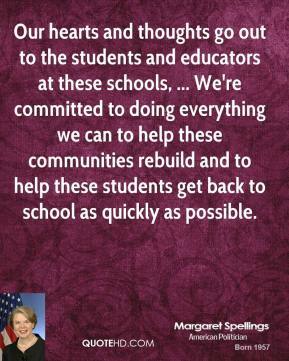 Our hearts and thoughts go out to the students and educators at these schools, ... We're committed to doing everything we can to help these communities rebuild and to help these students get back to school as quickly as possible. 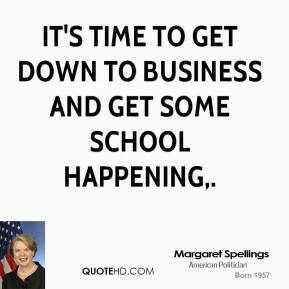 It's time to get down to business and get some school happening. 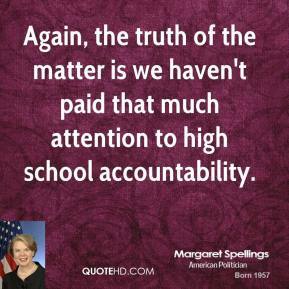 The achievement gap is closing and that is great news for every student, ... 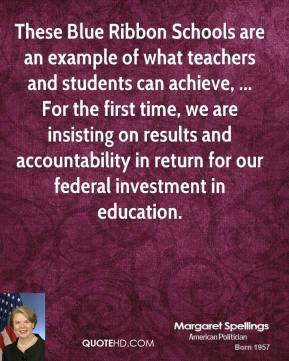 These Blue Ribbon Schools are an example of what teachers and students can achieve. 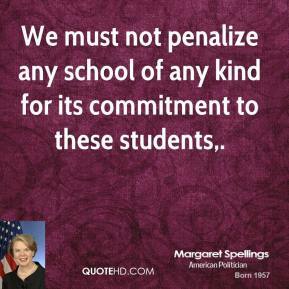 We must not penalize any school of any kind for its commitment to these students. 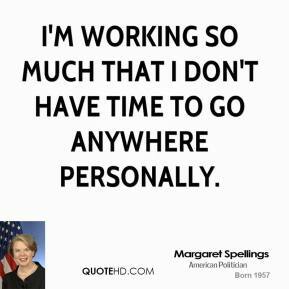 I'm working so much that I don't have time to go anywhere personally. 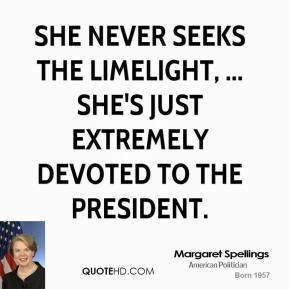 She never seeks the limelight, ... She's just extremely devoted to the president. 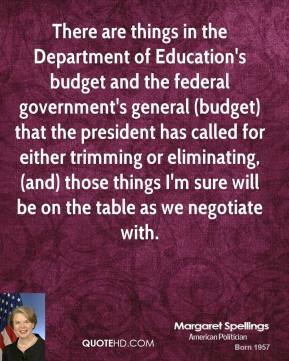 There are things in the Department of Education's budget and the federal government's general (budget) that the president has called for either trimming or eliminating, (and) those things I'm sure will be on the table as we negotiate with. She doesn't want to be in the paper, ... She's all about the president. Will people think she is important and in the know for her next gig? 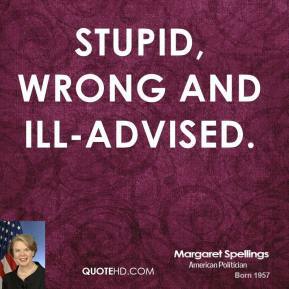 I can tell you she is and she is. 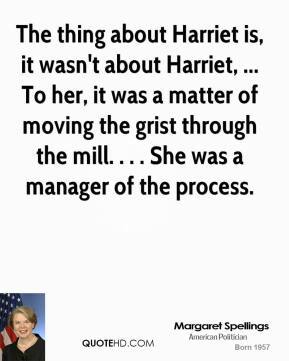 The thing about Harriet is, it wasn't about Harriet, ... To her, it was a matter of moving the grist through the mill. . . . She was a manager of the process. 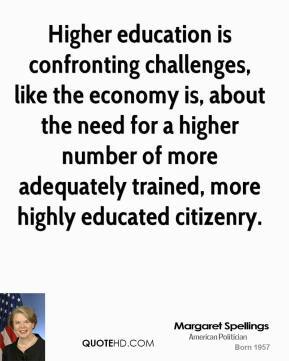 We make small fixes with programs to emphasize key areas, but we don't think strategically about the bigger picture, ... We can't afford to leave the future of our nation's higher education community to chance. 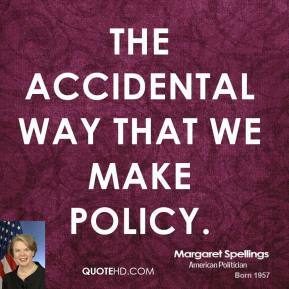 the accidental way that we make policy. The absence of good, sound data makes it difficult to set policy at the federal, state and institutional levels, ... It's time to examine how we can maximize our investment in higher education. 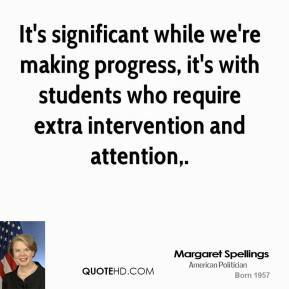 It's significant while we're making progress, it's with students who require extra intervention and attention. 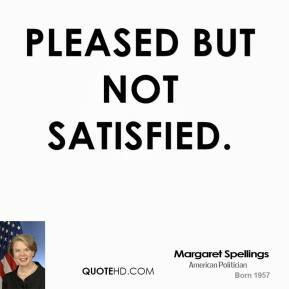 The result does show us we need to accelerate progress at all grade levels, with all kids, if we are to meet those goals. My top priority is raising student achievement, and I'm going to be as flexible as I possibly can to help all students, ... This is about children's futures and ensuring that New York City's parents have as many options as possible for their children. In exchange for more flexibility, New York City has committed to being accountable for making high-quality academic help available to more students, which will lead to increased achievement. 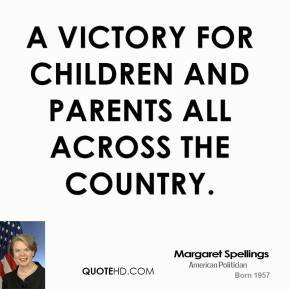 a victory for children and parents all across the country. 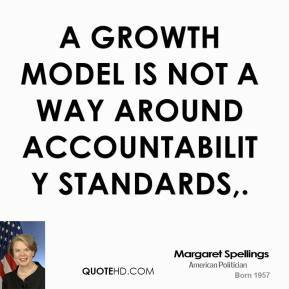 A growth model is not a way around accountability standards.